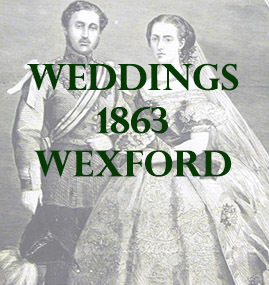 The following list contains marriages that mention places in county Wexford. At the Church of the Immaculate Conception, Wexford, John Hinton, Esq., merchant to Mary Teresa, daughter of James Harpur Esq., ex-Mayor of Wexford. At Waterford, Frederick Acheson Montgomery Moore Esq., to Mary, daughter of Thomas Boyse Presser, Esq., of Waterford. At St Stephen’s Church, Dublin, Wilson Walsh Esq., son of Thomas Walsh Esq., of Lakeview, county Mayo, to Harriette, daughter of Henry Philip Woodroof, Esq., of Upper Mount street Dublin, and Kilowen, county Wexford. At Clonmore Church, Charles Taylor, Captain Royal City Dublin Militia, to Mary Aletta, daughter of the late Henry John Ogle Esq. Wexford Regt. At Clontarf Church, George Cashel, Esq., to Elizabeth Julia, daughter of the late Edward Sparrow, Esq., of Killabeg, county Wexford. At Johnstown Castle, Major the Hon. W . Forbes. Brother of the Earl of Granard, to Phillis, daughter of John Rowe, Esq., J.P and D.L., of Ballycross House, county Wexford, and niece of Lady Esmonde. At the Wesleyan Chapel, Stephen’s-green, Dublin, C. H Pearson, Esq., to Lizzie, daughter of the late George Tocksberry, Esq., of Wexford.